The Bots, The Whole Bots, and Nothing But The Bots . . . There is a lot of controversy and questions around the use of robots (“bots”) in Second Life. Obviously, bots used to steal content are not only illegal and against SL’s Terms of Service (TOS), but they are unethical and undermine the very thing that makes Second Life so amazing — user content creators. For the most part, Bots can be very useful to shop owners, roleplaying, and the fashion industry, to name a few. A bot is an avatar which is controlled by a machine, rather than by a human. This can have various uses, such as to perform group invitations (which isn’t possible via LSL), perform as a non-player character (NPC) in a roleplaying game, as mannequin in a shop etc. An SL bot account can be created in the same way as a human-controlled avatar. The only requirement is to mark the bot’s account as a scripted agent. Bots are controlled by a program, and the owner has to choose the program from available alternatives. The program can run on user’s computer, or be hosted at Second Life bot hosting. With a hosted bot, it’s not necessary to have your computer running 24 hours per day. • Performing any other activity prohibited by TOS. For more information on Linden Lab’s policy on bots, click here: Linden Lab Official:Inworld policy on bots. Traffic is a numerical metric calculated for every parcel of land inworld. This score can be summarized as the cumulative minutes spent on the parcel by all visitors to the parcel within the previous day (PT). Bots, or scripted agents, are avatars controlled by computer programs rather than people. In calculating traffic scores, the number of visitors include bots, which has led to their use to increase traffic scores and boost search rankings. 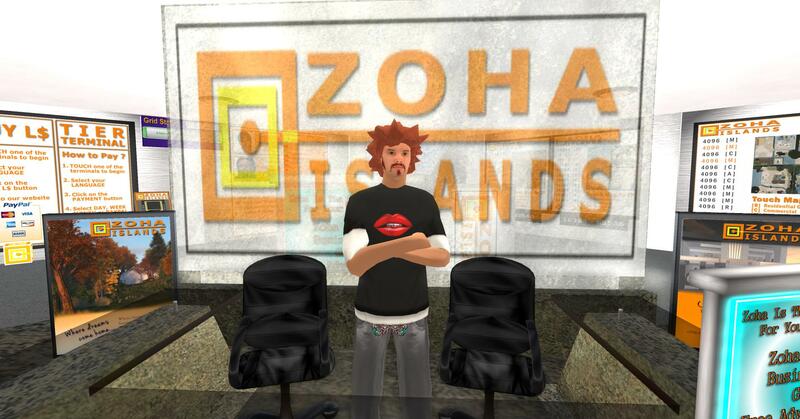 Here I am, sitting at ZoHa Island’s office, writing my blog. This could be considered “camping,” if I stayed here very long, which, as opposed to bots, is a way some shop owners use real avatars rather than bots to increase traffic on their sims. Sometimes, shop owners pay people a nominal amount (usually noobs) to camp on their sim a certain number of hours per week in order to drive up their traffic numbers, and thus boosting their position in the search function. Some bots are used to automate communications with parcel visitors, and to provide interactive services for human users. These types of bots can enhance the Second Life experience. Every chat message, IM, inventory offer, group notice, group IM, and group invitation creates load on the Second Life communications services. There is an upper limit where bots consume excessive resources and threaten to decrease the quality of service for others. Bots, per se, are allowed and have legitimate uses, but inappropriate uses are violations of LL’s policy. As stated above, using bots to “game” traffic is not allowed. Business owners or club owners or anyone else may not attempt to gain an unfair advantage in search results through the use of bots to inflate the traffic for a parcel. This policy applies to both mainland and private estates since both are represented in search. In addition, using bots to send an excessive number of messages is not allowed. Bots cannot send more than 5,000 messages in a calendar day. Group messages are counted as one message for every recipient in the group. All bots operated by a single user share a common limit. • Bots causing unreasonable load on search or the regions in which they operate. • Bots causing a nuisance by regularly getting stuck at welcome areas or infohubs. This includes the use of large numbers of land bots to get around the throttling of search requests. • Bots joining groups and sending group IMs or notices such that more than 5,000 individual messages will be received. • Bots sending more than 5,000 individual messages in a calendar day. • Using multiple bots to send an aggregate of more than 5,000 individual messages in a calendar day. Using bots to purchase Mainland parcels is not allowed. The use of bots, autonomous software, scripting (manual or automated), scripted agents, or any systems or software internal or external to the Second Life service that circumvent, automate and/or remove the human interaction required to purchase a Land parcel within Second Life on the Linden Lab owned Mainland is prohibited. If you own a Second Life account that is primarily operated by a Scripted Agent (a “bot”), identify it as a bot on the Scripted Agent Status page. By identifying bots, you can help Linden Lab give you more accurate account statistics and in world search results. Linden Lab routinely looks at search results, and will treat use of bots to gain an unfair search advantage as an abuse issue. You do not need to file an abuse report for violations; Linden Lab monitors the search results. Initially, Linden Lab will send a warning message to the land owner. If the issue persists, then account suspension or removal from search may result. If you feel there has been an unfair decision in this regard, use the abuse appeals process. Linden Lab routinely looks at message volume, and will treat use of bots to send excessive messages as an abuse issue. You do not need to file an abuse report for violations; Linden Lab monitors aggregate communication volume. Posted in HINTS & TIPS. Tagged Bots, Linden Lab, Robots, Second Life, use of bots in Second Life, ZoHa Islands.